A perrenial plant growing up to 1.5m tall with bright yellow flowers in large flat umbels. Feathery leaves. Although the feathery leaves and anise flaivoured bulb root of the fennel are used in cooking it is the seeds that are used in herbal remedies. It is said to relieve indigestion, bloating and wind. Helps to freshen breath. It is sometimes recommended for period pains and is said to increase the flow of milk in nursing mothers. It was traditionally used in Gripe water given to babies with colic. 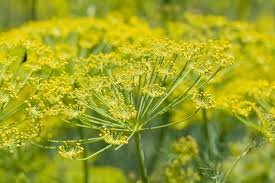 It was used by the Egyptians to treat digestive ailments and by Greeks and Romans both culivated fennel - Hippocrates recommended it for babies with colic. 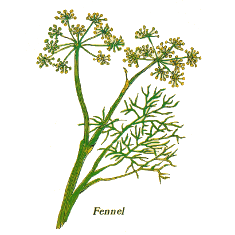 In the middle ages fennel was used together with St Johns wort and other hebs as prevention against witchcraft.